Lytham St Annes Inshore lifeboat crew were paged at 4.05am to standby as a stranded yacht re-floated at high water on Saturday 7th July 2018. The casualty, with two crew on board, had been sailing from Preston to Lytham on the previous high tide when she ran aground on the South training wall at 4½ miles from Preston Dock near to the wreck of the wooden barque Henrietta. The training walls that line the Ribble channel are mostly made of rock and have damaged or sunk many vessels that have strayed onto them over the years. Due to the calm weather at the time of stranding, the yacht sat safely during the low water period, but the danger time would come as she re-floated. The Inshore Lifeboat was requested to stand by and give assistance if needed. 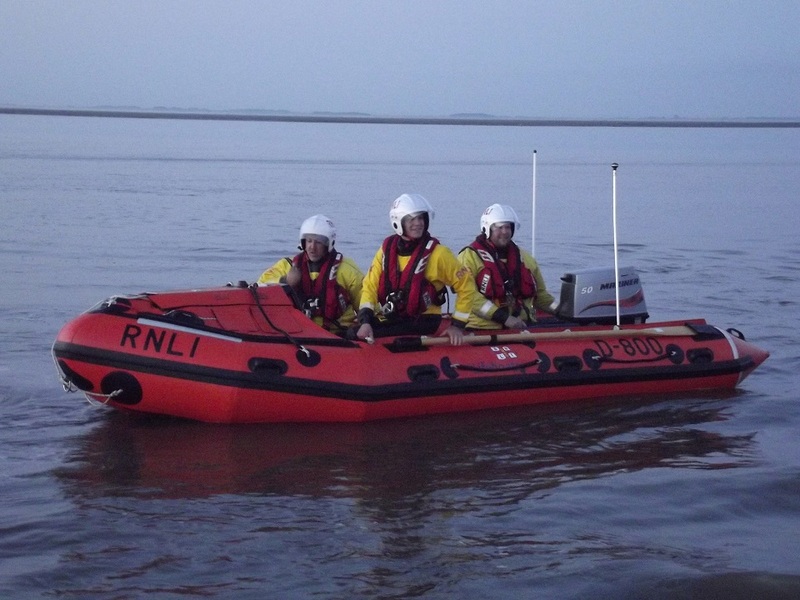 The inshore lifeboat (ILB) D-800 MOAM was launched from Seafield Road with Helmsman Tom Stuart in command and headed upriver to arrive at the yacht as the incoming tide was beginning to reach the vessel. After checking the yacht over and re-laying her anchor to a more suitable position, the ILB stood by until the yacht started to lift with the tide. A quick pull with the ILB brought the vessel off the rocks of the training wall, the risk of using the yacht’s own engine and propeller being too great with the rocks under and around her. Fortunately no damage had been done to the yacht although the ILB escorted her some way towards Lytham to make sure that all was safe and working. Once all were satisfied with the vessel and her crew’s safety, the ILB returned to her station, arriving at 6.40am before being refuelled and washed off and ready again for service shortly after 7am. The yacht meanwhile arrived at a mooring off Lytham at 7am.